FROM ABJ EXTRA 1. NOW LIVE! The 2018-2019 Colony Loss and Management Survey! Although every season offers something unique to UC Davis Arboretum visitors, spring is perhaps the most spectacular. It’s when many California native plants blossom after an extended winter dormancy, native bees emerge from their wood and underground nesting sites and additional migrating butterflies and hummingbirds take advantage of this popular rest stop on their way to destinations further south. “For over 80 years we’ve curated a . . .
WEST LAFAYETTE, Ind. – Honeybees play essential roles in pollinating plants that humans and animals rely on for food. Declines in bee populations, including 20 percent of honeybee colonies per year in Indiana, threaten our food supply. Insecticide exposure, loss of flowering plants, and fewer nesting habitats, disease and parasites are all factors. In research published this week in Environmental Entomology, colleagues and I at the U.S. Department of Agriculture’s Edward T. Schafer Agricultural Research Center, in collaboration with North Dakota State University (NDSU), investigated transportation stress while bee hives are in transit to identify sources of stress that may affect survival and pollination ability. Not even a week has passed since this year’s Colony Loss and Management survey went LIVE! 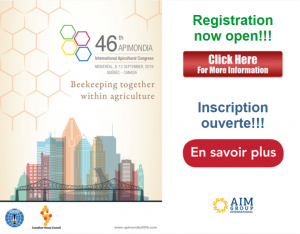 As of this morning (4/5/2019), more than 1,200 beekeepers have already entered their information. WOW! Thank you for your time and continued support! So far your response rate is tracking previous years, but of course, we want to beat last year’s numbers! So please, spread word about . . .
Pollinators are critical in the production of most fruits and vegetables. According to the USDA, three fourths of the world’s flowering plants and about 35 percent of the world’s food crops depend on pollinators to reproduce. While there aren’t exact figures, surveys in the U.S. and Europe are documenting . . .
CORVALLIS, Ore. — A groundbreaking two-year study in southern Oregon found greater abundance and diversity of wild bees in areas that experienced moderate and severe forest fires compared to areas with low-severity fires. The study, published today in the journal Ecosphere by researchers in the Oregon State University College of Forestry, is the first to demonstrate that wildfire severity is a strong predictor of bee diversity in mixed-conifer forest. . . . The GreenBee Wildlife Web Initiative LONGMONT, Colo., March 29, 2019 /PRNewswire/ — Pollinators need help and Waldorf schools and communities are taking action. Honey bees, wasps, butterflies, moths and more … these are a few of the pollinators needed throughout the agricultural and natural world. As part of the Waldorf education centennial celebration and an ongoing mission to create a more sustainable future, schools across the globe are taking action. Over the course of 2019 and 2020, an estimated 50,000 students in over 160 Waldorf schools across North America will be creating an ecologically green “continental parks system” by planting pollinator gardens and tending bees in backyards, playgrounds, schoolyards and public spaces. TROY, N.Y. — Nationally, crops pollinated by insects have a nearly $30 billion value. But pollinator populations are threatened by impacts such as development, which reduces habitat, along with pesticide use and changing weather patterns. Amy Howansky, of the firm Backyard Solutions, shared tips for “Attracting Pollinators and Birds to the Landscape” at the recent . . .
MERIDIAN — The Treasure Valley’s booming growth is hard on native pollinators — like butterflies and bees — whose habitats are disappearing in the construction. Juli Bokenkamp, president of the Meridian Co-op Gardeners, said without those native habitats, pollinators struggle to find a place to live. The Meridian Co-op Gardeners are planting . . . The Pollinator Protection Bill (H.205), which came out of House Agriculture and Forestry, was reported and passed on Tuesday and Wednesday. If passed by the Senate and signed by the governor, it will ban the use of neonicotinoid pesticides for outdoor, household use on July 1, 2019. . . .
You’re about to see major modifications to Newfields’ campus and its Virginia B. Fairbanks Art & Nature Park. A series of grants and gifts worth $21.7 million will introduce a fall festival on a scale similar to Winterlights; more food events; a multi-use path that helps cyclists reach the grounds; trail improvement; an open pollinator meadow; and fresh contemporary art. The projects are on the front end of a 30-year master plan that . . . However, new legislation being filed in Texas would prevent most bee keepers from performing this valuable service unless they first . . . The information that you provide will . . .